Why aren’t cyclists required to sit tests before using the public highway? It’s good to know that this site is getting its message across to those who believe in the existence of long-dead ‘road tax’. Cyclists tend to know that roads are paid for by general and local taxation; sadly, some motorists believe their graduated vehicle excise duty coughs up for provision and maintenance of the carriageway. Earlier today I got an email from a motorist who clearly stumbled upon the site via Google. He left with some facts (his email subject was “I have learned something”) but asked why cyclists don’t have to sit tests, as motorists do. I replied to his question with two emails (I’d missed out a pertinent fact in the first) and the correspondence is below. I am a car driver and motorcycle rider. For both I pay vehicle tax. I have just come to renew my tax and came across your site. I must admit that when I am commuting on my motorcycle, I am one of those people who mutter under my breath “pay some bloody road tax” to those cyclist that get in my way. Thanks to your site I now know better. I like to be educated about things (especially my prejudices) and would like to thank you for putting me straight on this. May I make one suggestion though. Before I was allowed on the road, on a motorcycle, I had to spend a morning learning road proficiency followed by an afternoon of tutored on road riding. This was in addition to having to pass a theory exam. I realise that the administration of such a routine would be prohibitively expensive to administer and enforce for bicycle riders, but feel that a few incompetent cyclists are giving the rest of you a bad name. The law has tended to be quite clear on the testing issue: testing is proportional to power output. Adding a motor creates faster, more powerful vehicles so operators of motor vehicles are subjected to a form of test before being allowed to propel their machines on the public highway. It’s important to stress there’s no requirement for a motor vehicle operator to have formal lessons before starting to use the road under power, merely that they must sit an exam. Road users propelled by engines often have a great deal of power at their disposal so, potentially, pose a risk of harming others. The compulsory examination of a motor vehicle operator happens just once and, as is plain for all to see, does not lead to automatic compliance with road laws. For instance, the majority of motorists admit to breaking speed limits and some do so habitually, at great risk to others. Regrettably, cyclists also break road laws and, yes, such law breaking is often deemed to be behaviour common to all cyclists. Given that cyclists do not have engines (apart from those who operate electric bikes, but that opens up a whole new can of worms) the law has not seen fit to require testing before cyclists start using the public highway, even though they operate what the law has considered a carriage since 1888. This carriage, ridden carefully by an unprotected operator who risks injury to their self, is deemed to be capable of causing little harm to others. In this respect cyclists are like pedestrians. Test cyclists who use the roads, and you’d have to test pedestrians who use the roads. However, despite there being no legal requirement for cyclists to sit tests, a great many cyclists are given road training. Many children get Bikeability training at school and there are many cycle trainers around the UK who offer Bikeability training for adults. It’s also worth pointing out that nearly ninety percent of cyclists own cars and so have passed the driving test. Road tax doesn’t exist. It’s car tax, a tax on cars and other vehicles, not a tax on roads or a fee to use them. Motorists do not pay directly for the roads. Roads are paid for via general and local taxation. In 1926, Winston Churchill started the process to abolish road tax. It was finally culled in 1937. 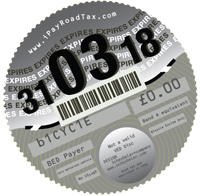 The ironically-named iPayRoadTax.com helps spread this message on cycle jerseys. Car tax is based on amount of CO2 emitted so, if a fee had to be paid, cyclists – who are sometimes branded as ‘tax dodgers’ – would pay the same as ‘tax-dodgers’ such as disabled drivers, police cars, the Royal family, and band A motorists, ie £0. Most cyclists are also car-owners, too, so pay VED. This entry was posted on Wednesday, December 12th, 2012 at 5:45 am	and is filed under No such thing as road tax!. You can follow any responses to this entry through the RSS 2.0 feed.